There may be many questions you might have before travelling to Turkey. For example, "I have to go to Turkey in what season, will I need a guide, can we provide easy access by public transport such as?". What are the currencies that you can use in Turkey? The currency in Turkey is the Turkish Lira (TRY). It is very easy to exchange currency in large or medium-size cities but may be slightly more difficult in villages or less populated areas. Dollars and Euros may also be used when shopping in certain touristic areas of Turkey. Which are the languages spoken in Turkey? The language of Turkey is Turkish. In bigger cities and tourist areas, English is widely spoken, especially in touristic facilities. But many Turkish people in the tourism industry speak multiple languages, including French, Russian, Japanese, German, etc. Turkey’s large telecom service providers offer internet access across every region. It is also possible to find free Wi-Fi in many cafes and restaurants, and in almost all hotels. Transportation is easy in Turkey? Turkey’s transportation system is very efficient. Many cities and even smaller towns have airports; metropolitan areas offer metros, trains, trams, buses, dolmuses (minibusses) and marine vessels. Turkey’s culinary traditions are just as colourful as the rest of the country. Spicy meat dishes are more popular in the east, and as you move closer to the west, fish dishes and vegetable dishes with olive oil become more prominent. Is it safe to travel alone in Turkey? You can spend a holiday alone or with your family in Turkey. When is the best time to visit Turkey? Turkey is a wonderful destination in any season. You can come in the winter for winter sports; for swimming and boating in the summer; and for cultural tours in the spring and autumn. How developed is public transportation in Turkey? Public transportation in bigger cities is efficient; however, in more remote areas or smaller towns, renting a car may be a better option. Is it necessary to learn Turkish before going to Turkey? If you are in touristic areas, you don’t need to, but it is always useful to learn a few Turkish words and phrases that you can use in daily life. Where is the first place to go if you are travelling to Turkey for the first time? Istanbul should be the first stop for any first-time traveller to Turkey. Are there options for vegetarians and vegans in Turkey? You can find all types of food in Turkey. Turkish cuisine includes many dishes that are suitable for vegetarians and vegans. What type of tourism is in Turkey? Turkish tourism covers an incredibly wide spectrum: from the Mediterranean coastline to the Aegean seaside; from historic sites to natural beauty throughout the country. As such, it is suitable for both cultural and leisure holidays. 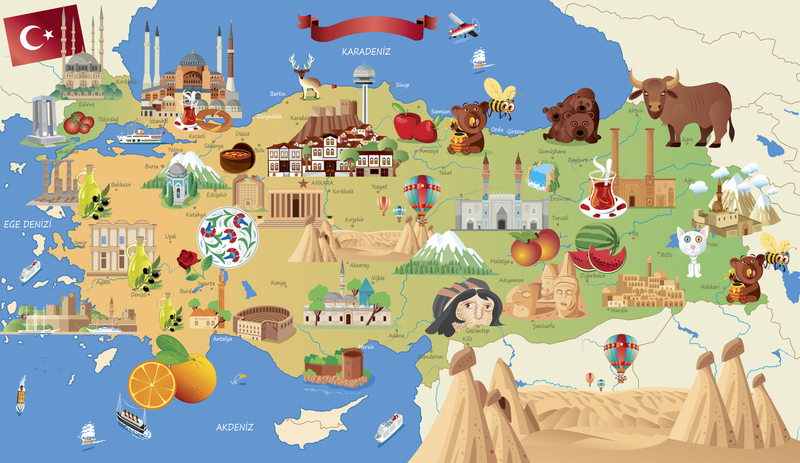 Where is a good place to start a holiday in Turkey? It depends on the individual traveller: if you’re looking for a beach holiday, start in Bodrum, Fethiye or Antalya; for more emphasis on history, start in Istanbul. If you want to know more about Turkey’s rich ethnic culture, you can begin your trip in Turkey’s southeast region. There are two types of holidays in Turkey: official and religious. Like most of the world, New Year’s Day (January 1) is a holiday. Official Holidays in Turkey: April 23, National Sovereignty and Children's Day; May 1 International Worker’s Day; May 19 The Commemoration of Atatürk, Youth and Sports Day; July 15, Democracy and National Unity Day; August 30, Victory Day; and October 29, Republic Day. Eid al-Adha is a four-day Islamic religious celebration, including consecration for Allah in Turkey, as it is throughout the Muslim world. Muslims slaughter cattle, sheep and goats, and distribute the meats to family, neighbours, and those in need. Eid al-Fitr is celebrated for three days in Turkey, as it is throughout the Islamic world, to commemorate the end of the month-long Ramadan fast. How much will a holiday in Turkey cost? Turkey is a country where you can spend a lot or very little for a holiday. You can find hostels for as low as 10 euros and ultra-luxurious rooms that start from 6,500 euros per night. Is transportation expensive in Turkey? Public transportation is very affordable. You can travel economically by metro, metrobus, bus, train, plane and ferries. What is the cheapest transportation to airports in Turkey? Depending on the airport, the cheapest way to get from the airport is to use the municipal bus or metro systems. Some flight booking services also provide comfortable shuttle or service buses at reasonable prices. What is the cheapest transportation between the ıstanbul airports and the city centre? The airport shuttle bus services offer inexpensive transportation to and from the Istanbul airports and the city’s central areas. Is ıt cheap to rent a car in Turkey? You can rent vehicles at affordable prices in Turkey. Pegasus car rental service provides you with very convenient service! Is it expensive to travel with my pet to Turkey? While you will need to obtain the proper documentation for your pet, once you arrive, you will find that Turkey is an animal loving country. People feed street cats and dogs here, and you can find all services for your pet at very reasonable prices. Are there cheap places to stay in Turkey? If you make early bookings, you can stay at Turkey hotels for very reasonable prices. If you are planning to go to metropolitan areas such as Istanbul, Ankara and Izmir, or to popular resorts such as Bodrum and Dalaman, you can stay at hostels for very cheap rates. If you get to the eastern regions of Turkey, it is possible to stay at boutique hotels for very affordable rates. Bungalows and pensions also offer cheap rates. Is there cheap food in Turkey? Yes! It is very easy to eat on a budget in Turkey. The cheapest meals can be found at small restaurants, called ‘artisan’ or ‘home-cooked food’ restaurants, as well as at international food chains. Is nightlife cheap in Turkey? For someone visiting Turkey from abroad (especially from countries where the euro, dollar or pound are in use) nightlife is cheap. While prices may be higher in popular resort areas, if you know where to go, you can find affordable places everywhere. Can I find cheap cell phone companies in turkey? Both international and local GSM operators are available in Turkey, and their voice, text and data package prices are reasonable.